Happy New Year and welcome to 2018 – a time for a fresh start and a great opportunity to set up healthy habits for both you and your furry family members. While you’re working hard at carrying out your New Year’s resolutions, also make a commitment to your pets to help them have their healthiest year yet! 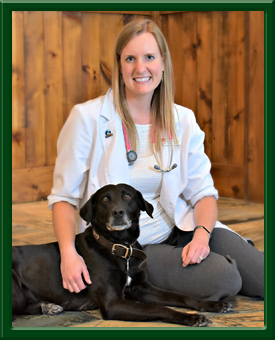 Below, the doctors from Leesburg Veterinary Hospital share their tips to help you stay on track all year long. Take it slow when starting a new exercise regimen – especially during the colder winter months! It may sound counter-intuitive, but my recommendation is to avoid too much exercise this winter with your pets. Since most of our pets are “couch potatoes,” their bodies are not prepared for the cold weather in regards to pad protection or keeping warm. Even though they have a fur coat, animals are not as conditioned for cold as you might think. We recommend a coat for short hair animals. Also, look out for snowballs hiding in the webbing of their feet and ice cutting their pads with exuberant exercise. And watch out for over-exertion in the deep snow. Many animals will tear knee ligaments and pull muscles by running and jumping in the snow, especially when adrenaline makes them feel like they can keep up with you. Have fun in the brisk outdoors this winter, just take it slow to reduce injury or over-exertion! Reduce fear in stressful or new situations. Many pets experience some level of stress or anxiety in either new situations or learned/feared trigger events. These situations can include thunderstorms or loud noises, car rides, and even vet visits, just to name a few. My tip is to quickly identify the cause so that we can best create a more stress-free and inviting environment. * Developing a plan and providing resources to keep your pet happy is something we take pride in doing. Fear that we ignore or do not acknowledge can turn into unwanted and adverse behavior. *LVH is proud to be a “Fear Free Practice.” This means we’re implementing methods and protocols that reduce stress or remove anxiety triggers, which creates an experience that is rewarding and safer for all involved. Here, a little peanut butter went a long way in creating a positive experience during Bella’s puppy checkup! 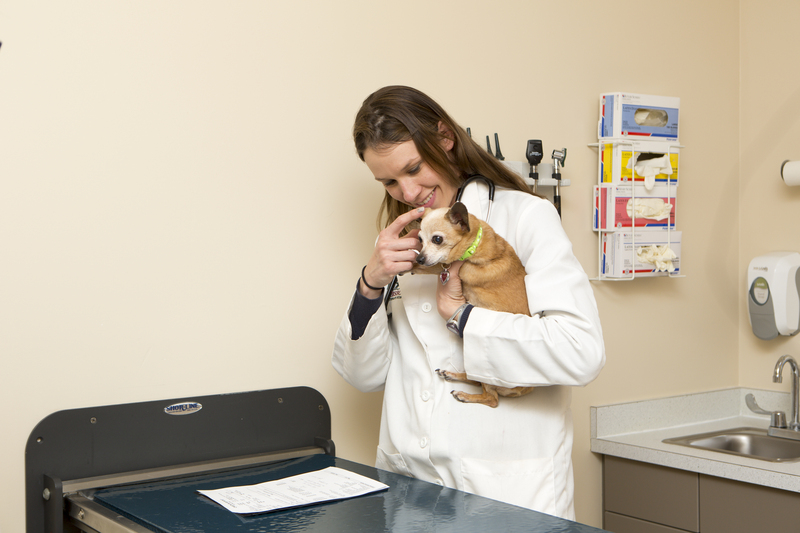 Actively work on building positive veterinary experiences for your pet. I encourage all owners to try to foster a positive relationship between their pets and their veterinarian. Taking the time for positive happy visits (This could be as simple as stopping by for some treats or belly rubs.) and listening to suggestions for other anti-anxiety methods can make a big difference in the veterinary experience you and your pet have over the years. We would much rather spend time building a positive relationship with your pet instead of seeing very scared pets – this is stressful for the pet, you as the pets family member, and on some occasions, even the veterinary staff. As Dr. Dunn mentioned above, Leesburg Veterinary Hospital has enrolled our staff to become Fear Free Certified; we have also become certified as a Feline-Friendly Practice! You should see many changes when you visit our hospital that help promote positive veterinary experiences and can even find helpful hints on our website. Maintain a healthy weight and body condition by measuring food. Make 2017 the year to keep or get your pet to a healthy weight and body condition! Excess weight increases the risk for developing endocrine and systemic diseases and puts increased stress on the joints and heart. Pets in an ideal body condition enjoy a longer and higher quality life! We can assess your pet’s body condition score during your pet’s exam; you can also view the standardized body condition scale here. One of the easiest ways to maintain a healthy weight and body condition is to focus on the amount and type of foods your pet is eating. Start by measuring how much food goes into their bowl. You’d be surprised how many people just fill up the bowl once a day or whenever pets start scratching or begging. The nutrition label on their food bag will give you a good idea of what a reasonable amount of food is for your pet’s weight. Additionally, when a pet is on a diet, make sure you are feeding a “light” or diet food, so they are getting the appropriate amount of vitamins and minerals. And don’t forget about treats and table scraps, which can add a lot of unnecessary fat and calories. Substitute a baby carrot, slice of apple, green beans, or a few kernels of plain microwave popcorn for dogs, and a small piece of canned tuna or chicken for cats. Discuss steps for weight loss or maintaining weight with your veterinarian to be sure it is done safely. Do you really know how much food you’re feeding your pet every day? Read the food bag label or talk to your vet about the optimal amount of food for your pet. Seriously! Veterinarians have a wealth of knowledge that can help you with your pets or maybe even before you ever get a pet. We can help discuss breeds of dogs or cats that may suit your family best. How do you keep your pet healthy? We can help create a preventative health care plan specialized for your pet, based on their lifestyle risk factors. Unsure if you should be feeding your beagle a salmon-based food? What about chicken by-products? 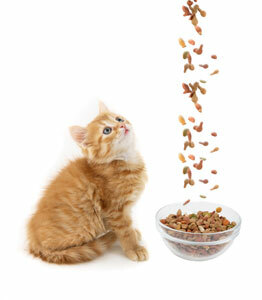 We have training in animal nutrition to help you sort through the wide array of pet foods available. Maybe you notice that your older pet seems to have slowed down a little. We can help decipher the multitude of joint supplements and chronic pain management options to find the best treatment plan for your pet. We are here to help you and your four-legged family in any way we can. Keeping your pet’s veterinarian in the loop about medical and health questions is the best way to keep your pet feeling great through the next year! Dr. Rockwell, and all of the doctors at Leesburg Vet are here to answer your pet-related questions! Brush your pet’s teeth, ideally a few times per week. 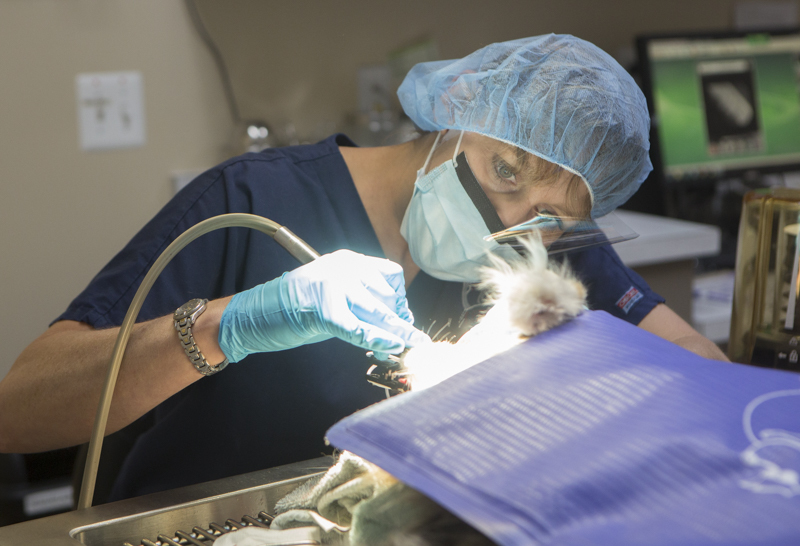 To follow up on Dr. Kloer’s point, dental health can be so easy to overlook, but it really is a vital part of keeping your pet healthy and happy. The “gold standard” is a toothbrush (or finger brush) and enzymatic toothpaste. Most pets are surprisingly tolerant of these, but, of course, not all are. For pets that are more standoffish or stubborn to a brush, dental chews are a possible second choice. It is also very important that pets not be allowed to chew on items that are too hard as this could cause their teeth to fracture. A good rule of thumb is that if you can’t dent the chew toy with your fingernail, then it is probably too hard for your pet to safely chew on it. Just like us, brushing does not replace the need for a professional cleaning, but it can dramatically increase the interval of time before a pet needs their teeth cleaned again. Another huge benefit of maintaining your pet’s dental health is their breath will be so much better! For a great demonstration of how easy it is to brush your pet’s teeth, watch this video of Dr. Boyle with her lovely assistant, Elphie. Treat your pet to a dental day. Our doctors are serious about pet dental health and for good reason! Periodontal disease is the most common disease in dogs and cats five years and older. Smaller dog breeds like my toy poodle, Molly, are predisposed to periodontal disease as early as three years old. Radiographs in these young small breed dogs can be surprising. I found a fractured tooth in Molly at four years old based solely on the radiographs as I was not able to tell by just looking at her tooth. Tartar, in general, may not be pathologic but once the gums become red and inflamed from the bacteria present, this infection needs to be addressed sooner than later to prevent tooth loss or more concerning heart, liver and kidney disease. Halitosis is a major concern and can affect the bond between a pet and their owner. Some cats are unfortunately subject to gingivostomatitis and require aggressive therapy in the form of full mouth extractions. Refer to the animal owner section at www.avdc.org for more information, or please feel free to ask us at your pet’s next appointment. You can even test your dental health knowledge by taking our quiz here! Dental health and oral hygiene are extremely important to your pet’s overall health. Besides trying to brush your pet’s teeth at home, we may recommend regular cleanings. Dental cleanings include ultrasonic scaling, followed by polishing and a mouth rinse, all of which are designed to remove plaque and slow its build-up. We hope these suggestions help you and your furry friends have a happy and healthy 2016. Do you have a pet resolution that wasn’t mentioned? Please share in the comments section or on our Facebook page.